The objective of HSTP was to diffuse the micro-level educational experiments into the mainstream at macro- level, Eklavya collaborated with the State Council of Educational Research and Training (SCERT) of Madhya Pradesh in conducting the landmark Hoshangabad Science Teaching Programme (HSTP) and in developing and implementing the Social Science Programme in government schools. The focus was to stretch beyond the purely academic aspects to include support systems - teacher training packages, extra-curricular packages, administrative reforms, etc - needed to make these curricular packages working realities in schools. 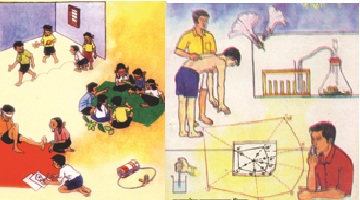 The Bal Vaigyanik workbooks developed under the HSTP translate the idea of learning science by the method of doing and by observing one’s environment. Foreword In this report we share with you a truly momentous leg of our long journey. Two events i..
इस पुस्तिका में बाल वैज्ञानिक कक्षा 6, 7 और 8 के अध्‍यायवार प्रयोग और प्रश्‍न दिए गए हैं। इन्‍हें हल..